This half painted wall has served me well for outfit pictures in the past. It had just started to rain and in an attempt to get pictures done before the inevitable downpour, we ended up there again. Our camera seems to be giving up the ghost and continually jams, so I should just be happy we got some pictures because I really wanted to share this rather fabulous skirt. I can't help but think that this skirt deserves more though... I'll just say it. 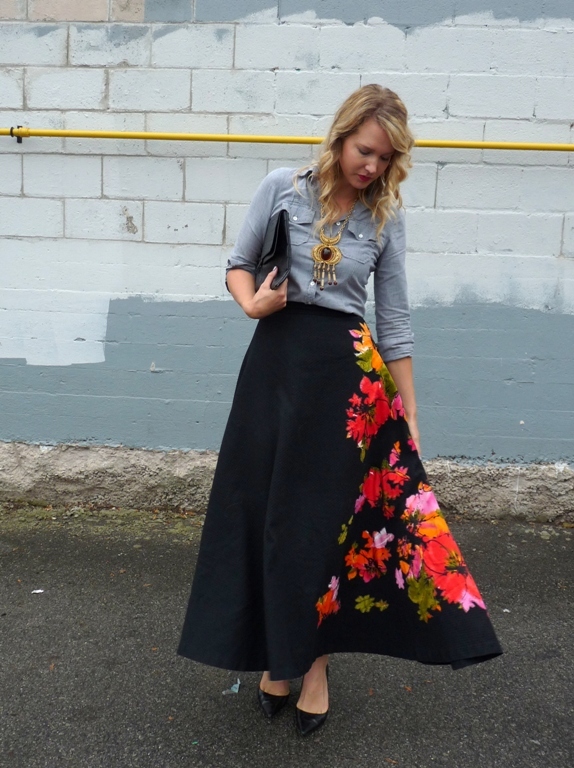 The movement of this skirt and the amazing floral appliqué deserve to be captured by a street style photographer. Preferably as I am rushing into a Paris fashion show, talking on my phone (busted... no one talks on a phone any more) and being important. While obviously this skirt (or I, myself) did not make the Paris fashion show cut, this is the skirt I wore during the day of my 30th birthday yesterday. And yes, as much as I want to pretend turning 30 is not a big deal, it still kinda feels like it any ways. I have lots of thoughts on turning 30 but it's Canadian Thanksgiving today and there is family to see and food to eat. I will say that I had a few moments yesterday where I was verklempt with gratefulness. I think as I get older, I realize more and more that being a human being is hard. That life in general is complicated and messy and happy and sad and crazy and boring and every adjective out there really. But I am so blessed with my family and my friends; I am so blessed in general. Yeah, maybe my camera isn't working so well (in the grand scheme, not a major thing but an annoyance) but there is often a guy behind that camera who, despite the fact that he cares little for photos or for fashion, takes the time to snap a few shots for me... And there is a friend who listens when I ramble on about dreams or when I then, in turn, ramble on about my fears in realizing those dreams. And there is a mother, who gives me the best hugs, and who can still laugh even when it's not funny. ...but clyde is still cuter. 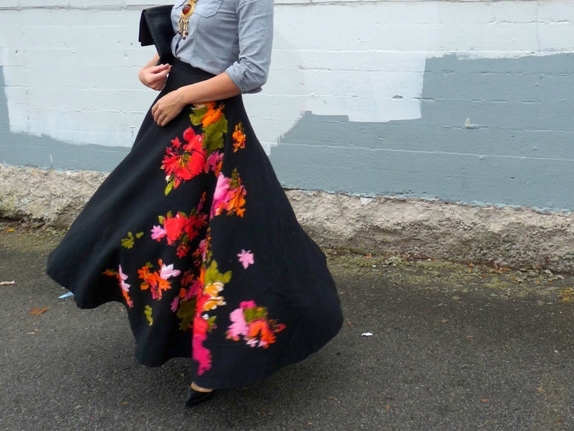 That skirt is a vintage find I dream of finding! Glad you had a lovely birthday. A very happy birthday and Thanksgiving to you Jen! It's been wonderful getting to know you on the blog! You, your skirt, and your words are all beautiful! Love how you styled your gorgeous skirt. You let it speak, but on the other hand the elements you styled it with were not too plain. Happy milestone birthday, Yen! What a gorgeous outfit to turn 30 in. Your best years (and outfits) are yet to come! We don't know each other personally, but I'm happy for all the blessings in your life. Happy Birthday Yen! The brightest wishes for dreams coming true! I have been lurking here for quite a while. 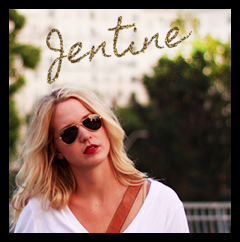 I love your finds and your amazing fashion sense and fun pairings! Happy Birthday to you! I love thrifting but haven't been diligent about doing it the past couple years. "I realize more and more that being a human being is hard." I agree. Well said and happy birthday my blogger bud! Beautiful skirt and beautiful comments. Happy Birthday! I'm turning 29 next week and not sure how I feel about being "almost 30", so it's good to have some perspective! Happy birthday sweetheart! Best wishes for the year ahead. That skirt is sensational. I actually gasped out aloud when I saw these pictures. Happy Birthday!! What an amazing skirt. I especially love the way you write your posts - it's lovely to read about your loved ones. Enjoy your special day and may your 30s be the best years yet!! Oh my goodness, you look so elegant and pretty - that skirt is just amazing! I hope that you had a really pretty birthday and a wonderful holiday! I hope you had a very happy birthday.. and Thanksgiving! Happy Birthday, Jen! And a happy Thanksgiving to you too. I was born on Thanksgiving (my birthday was on Wednesday) - we Libras are so appreciative of beauty! I love this gorgeous skirt - you work it so well. All the best to you. Happy Birthday young woman. From a woman who is much closer to fifty than thirty, though her brain refuses to accept that fact. That is an AMAZING skirt! Turning 30 didn't bug me too much, but turning 31 was weird - being IN my thirties. But now I'm 32 and it's NBD. Happy birthday to you and happy thanksgiving too! Happy Birthday! You look gorgeous, love your skirt! Happy Birthday! That skirt is fab! Hooray for turning 30! Both my BFF and I turn 30 this year and we're stoked. I hope I look as fabulous at 30 as you do in that skirt! You got me feeling very emotional with those last couple thoughts of yours. I felt it all in my chest and then I was a goner. It's so easy to get wrapped up and forget how lucky we are with our great people around us. Life is hard and weird and great and not exactly how you'd like always as you get older but keeping things in perspective makes the negatives less so the positives shine brighter. I hope you had a lovely birthday and that the strongest memories were your best moments!